A happy customer sharing her satisfaction with the fine leather Adjustable reins she purchased manufactured in the USA by Buckaroo Leather Products. Superior Leather Reins made in AMERICA! Made from the finest quality heavy weight Hermann Oak Harness leather or Latigo for a smooth, rich, "broke in" feel. With adjustable Nickel Plate buckles and Rawhide Keepers. THESE REINS ARE THE EXTRA LONG ADJUSTABLE TRAIL REINS OR LONGER ROPING REINS YOU HAVE BEEN WAITING FOR! 5/8" adjustable from 8' to 10' lengths. These Reins are also available Lined and Oiled for extra softness! Made from the finest quality heavy weight Hermann Oak Harness leather or Latigo for a smooth, rich, "broke in" feel. With adjustable Nickel buckles and replaceable snaps. THESE REINS ARE THE EXTRA LONG ADJUSTABLE TRAIL REINS OR LONGER ROPING REINS YOU HAVE BEEN WAITING FOR! 5/8" adjustable from 7' to 10' lengths. Perfect for western trail riding. Made from the finest quality heavy weight Hermann Oak Harness leather for a smooth, rich, "broke in" feel. With adjustable Stainless steel engraved buckles and buckles at bit end for easy bit changing. THESE REINS ARE THE EXTRA LONG ADJUSTABLE TRAIL REINS OR LONGER ROPING REINS YOU HAVE BEEN WAITING FOR! 5/8" width. Adjustable from 7' to 10'. Perfect length for trail riding. Rough-out Saddles and Horse Tack What is It? A popular type of saddle is a rough-out leather saddle or a "slick fork cowboy style" saddle. 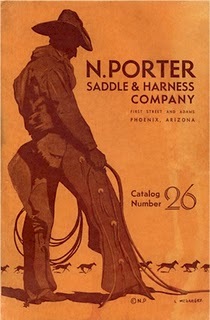 These saddles are popular for many reasons, including functionality for working cowboys. Buckaroo Leather has created new Rough-Out Breast Collars to match these cowboy rough-out style saddles. Leather saddles are made from heavy hides known as saddle skirting. Skirting comes in different weights (thickness) and grades (quality). The thickest skirting is used for the heavy wear areas such as fenders, stirrup leathers and seats. Skirting has two distinct sides – the grain side, which is smooth, and the flesh side, which is rough. A saddle can be made with either side facing out as the finished side. Most saddles are made with the grain side out. 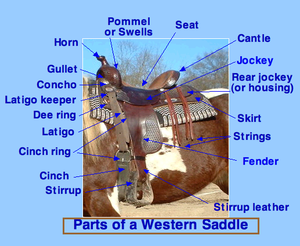 A saddle with the flesh, or rough, side facing out is called a rough-out saddle. A saddle can be completely rough-out or partially rough-out. Fenders, seat jockeys, and seats are the most common rough-out parts. The appeal of rough-out is that it provides additional grip and stick for the rider. For those riding for a job where function takes priority over looks (working cowboys, horse trainers), rough-out style saddles are quite common. These Breast Collars are designed to match the popular rough-out saddles and Buckaroo Wade style saddles. This Rough-out Style Breast Collar is made from Hermann Oak Bridle Leather. This Rough Out Breast Collar will match your Cowboy Style Rough Out Saddle. The saddle tugs have a 1" width. We recommend an over the Neck strap for the best fit. We have BC13ro- our over the neck strap in the rough-out leather style. Hand crafted from the finest Hermann Oak Rough Out Oiled Golden Bridle Leather w/ chap lining, this Old Martingale style shaped breast collar (some in the sage call it a "CHOKER") features an over the shoulder fit for a better pulling position. Also featured is the adjustable neck strap and billet. The breast collar is hand edged, rubbed and finished with nickel hardware. Hermann Oak Quality Leather Breast Collar rough-out style leather. The Breast Collar is 1 3/4" with 1" saddle tugs and 3/4" down strap. The Breast Collar is double and stitched and has a soft chap lining with Nickel hardware. For the best fit- add a rough-out style leather over the neck strap,BC13ro. NEW design Over the Neck Breast Collar strap designed to go up over the withers to hold your Breast Collar up in the correct position over the shoulder as not to rub across your horses shoulder. Fully adjustable and snaps on to any Breast Collar. NOW available in Rough-Out leather. Rough-out leather saddles, wade style saddles and slick fork saddles are all durable and the best choice for the working cowboy. To match this durability in your cowboy gear is the new selection of rough-out Breast Collars from Buckaroo Leather!!! Customer- "Hello this is Dennis from billings Montana do you have a catalog ?" John Brand- "Why yes I do sir. Appreciate your interest and I will send right up. But it's only about 1/3 of what we sell. Most is on our website." Customer- "Well I'm just a cowboy with no access to a computer. Don't know how to turn it on anyway." John Brand- "I understand. How did you find out about us?" Customer- "I am sitting here in the bunkhouse reading Cascade Horseman and saw your article." John Brand- "I thanked him." With all our computers, laptops, and blackberry's we forget about the real life and the true cowboys who still work the range today! In 1896 the United States Congress authorized Rural Free Delivery and by 1911 there was a local U.S. Post Office at nearly every crossroads in America... almost seventy-seven thousand of them! 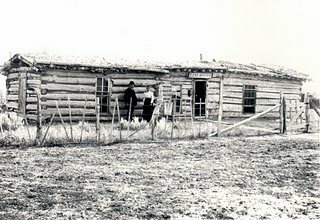 Cowboys, ranchers and farmers no longer traveled to the general store or the livery for their goods and horse tack, they could just order through a catalog and get it by mail. 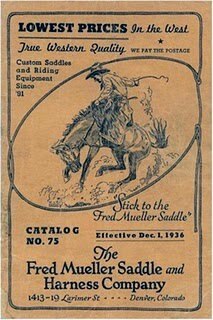 There was the Sears, Roebuck and Co., the Montgomery Ward & Co. and other catalogs that specialized in just American made horse tack, saddles and cowboy gear. The Sears Catalog was referred to as the Farmer’s Bible or The Wish Book. The 1897 catalog, available in reprint, shows what new and established residents of rural America needed to live and prosper, and it lives up to its Wish Book nickname. There were groceries, including long lists of flavoring extracts. Drugs follow, offering a wide range of homeopathic as well as conventional patent medicines; those living in rural isolation often coped with illness and injury alone and a full cupboard of remedies increased the chances of survival. Rural doctors also surely ordered from the catalog. Tools of all kinds comprised a large share of catalog pages, including well, wagon and domestic hardware as well as tools needed for home-building and farming. Both stoves, wood- and coal-fired, required serious consideration and expense; before a customer laid out $10 to 15 for a stove, he wanted to know about it in detail! In the 1900’s along with the Sears catalog, there was the Hamley & Co, the Fred Mueller Catalog, and the N. Porter Catalog. They offered the old time cowboy saddles, boots, western cowboy gear, and American made horse tack. 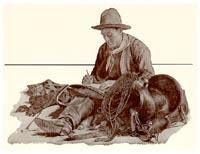 The mail order catalogs allowed the frontiersmen and cowboys to live their life on there own land away from the big city and have access to all their goods and western tack. To receive a copy of the Buckaroo Leather catalog with our American made western horse tack you can email me at buckaroojohn@sbcglobal.net or call (800) 873 0781. This video features our number #1 seller- the soft Alpaca Mecate Reins and our popular Leather Pulling Breast Collar. This Breast Collar has an old fashioned cowboy look with either basket stamp or wild rose hand tooled pattern. The shoulder fit is designed to wrap through the saddle swells, perfect for a pulling position. Barns By Harrahs provided a 3 sided shelter for Buckaroo John Brand and Buckaroo Leather to introduce our USA Made quality leather horse tack. Thank you to Barns by Harrahs- we had a great time talking to existing satisfied Customers and meeting many new ones. BuckarooJohn Brand demonstrates how easily and economically one can Modify their Western saddle to a Show Piece. The use of a variety of Silver Conchos does the trick. Buckaroo Leather has many conchos to choose from. Including these brand new sets that make it even easier! Buckaroo Leather has introduced a new set of hand engraved conchos for your saddle. We have made it easier for you to add all the Bling you want to your saddle. There are two styles, slotted and screwback. All of the conchos are hand engraved and silver plated and come in a set of 6. These unique conchas will really dress up that old saddle or create a new fashion statement at your next horse event. Silver Concha Saddle set for saddles with saddle strings, 6 piece matching set- 4 each 1 1/2" and 2 each 1 1/4" slotted to slide over saddle strings. Old Mexico style hand engraved silver plated. Silver Concha Saddle set for saddles with screw in/back conchas, 6 piece matching set- 4 each 1 1/2" and 2 each 1 1/4" long screw back to screw into saddle. Old Mexico style hand engraved silver plated.